This "Smokey" variety is simply described as, "A taste of mesquite, which is sublime..."
The first flavor to hit my palate is a saltiness, which soon brings on a teriyaki that's stronger on the soy sauce. I can pick up faint bits of worcestershire. The chewing brings on a little more of the worcestershire, with hints of garlic, and even more faint hints of smoke. There's also a light natural meat flavor in the latter part of chewing. For being advertised as "Smokey", it doesn't really have much smoke flavor to offer, which perhaps supports the company's use of the "sublime". The smokiness is very light and sits well behind the stronger teriyaki, soy sauce, and worcestershire. Otherwise, the primary taste profile is a salty, well-seasoned blend of marinades, again being the teriyaki, soy sauce, and worcestershire. I'd say the teriyaki and soy sauce is most noticeable initially, but the worcesteshire comes in stronger during the chewing. A light garlic is there, along with the natural meat flavors, and perhaps a hint of black pepper, and that's largely what you have. The meat consistency is great. The thick, meaty short strips wells up much anticipation and brings out the carnivore in me. 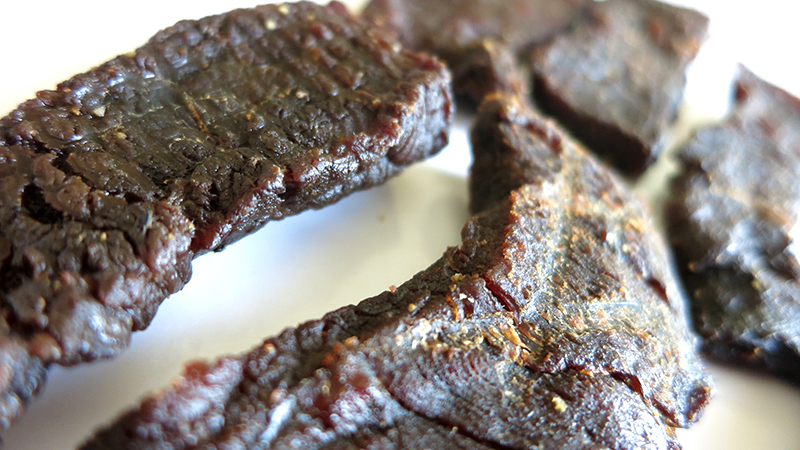 The chewing has a classic jerky chewiness, and feels just like real pieces of steak once chewed down. I don't find any bits or spots of fat, though there is some stringiness in the chewing. 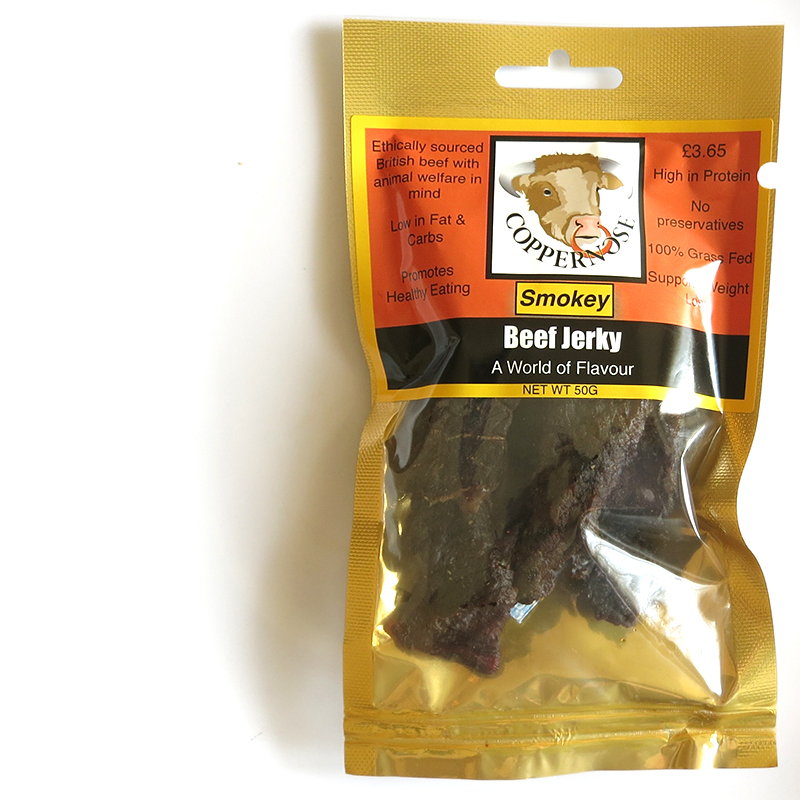 This "Smokey" variety from Coppernose Jerky doesn't belt out a strong smokiness, it's actually quite subtle. It probably falls short on American's expectations of smoked beef, but I'm guessing that for Brits is quite noticeable. Otherwise, on its own merits, this jerky generated lot of snackability for me. The meat consistency is perhaps Coppernose's best attribute. The chewiness is perfect, it chews like real steak. The thick strips creates a lot of anticipation and feels substantial. The flavor is overall savory and satisfying, yet it's nothing out of the ordinary. The combination of teriyaki, soy sauce, and worcestershire is quite common. Yet, I appreciate being able to taste the natural meat flavors instead of getting thumped by gobs of sugar and salt. 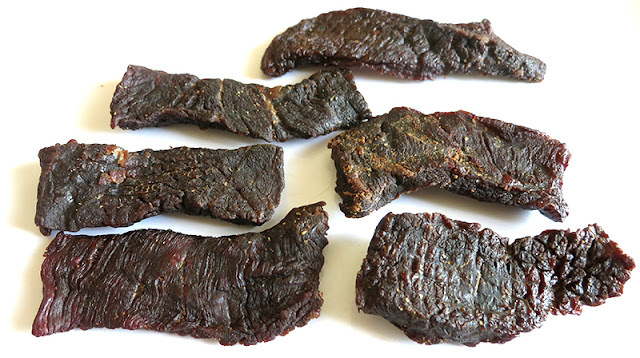 Overall, it's a somewhat old-fashioned jerky flavor, but it's done in the old fashioned style of using thick strips of meat in a meaty, steak-like chewing.